You may use one or the other or combine them if you like to. I have decided to combine mine, I think butterflies go so well with lace. My image is one that my husband drew, it's available for purchase at my etsy store "Digital Stamp Oasis". I have just added the 5 for 5 deal again, so you can get 5 digis of your choice for $1 each! I've colored it using derwent coloursoft pencils and blended with baby oil. My designer paper is a retired doublesided one from Stampin Up. I stamped a flourish stamp in old olive on two of the corners to add some extra interest. 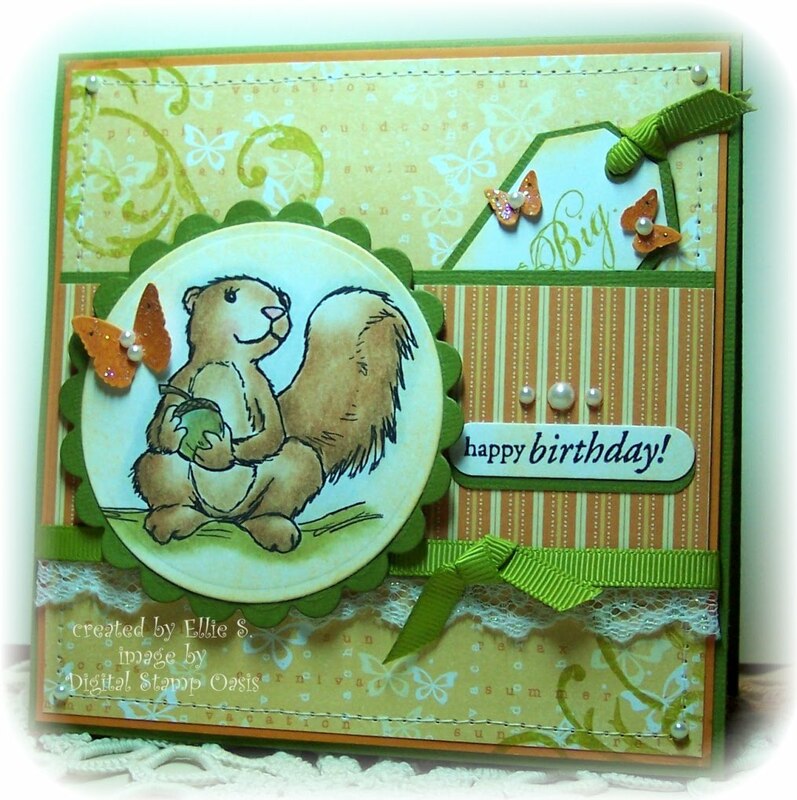 Card stocks are from stampin up (pumpin pie), bazzill (green), and couture white 80lb (white). I've embellished with some punched out butterflies (Martha Stewart), stickles glitter, sticky pearls, ribbon and lace. Then did some sewing with my janome sew mini. Loved the sketch from Friday Sketchers, so I decided to use it. Alright then, that should be all. Hope you'll all join the fun this week. I am also the sponsor this week, and the winner gets to choose 3 images from Digital Stamp Oasis. oh Ellie, this is gorgeous!!! I love the flourishes & lace!!! This qualifies for the Clearly Delightful challenge too-tag, you're it! You will receive a free digi set just for entering! This is such a great card and I love how you incorporated the tag. Your coloring is just fabulous!!! This is a sweet card!! Love the image!! Thanks for sharing it with us at Frosted Designs!! This is gorgeous Ellie. Love the design and colours. Thanks for taking part in this week's challenge over at DDCC. This is such a pretty card! I love the colors, the tag, the papers, lace...well everything. Its one of my favorite cards of yours! Gorgeous work, thanks for joining us this week at CCC. Beautiful card Ellie. Love the colors, your coloring, and those little butterflies! Great job on the challenge!